Back in 2004, the world was different; there was no social media or Kim Kardashian, no cold press juices or barre classes, and hardly anyone read blogs because almost nobody wrote them! 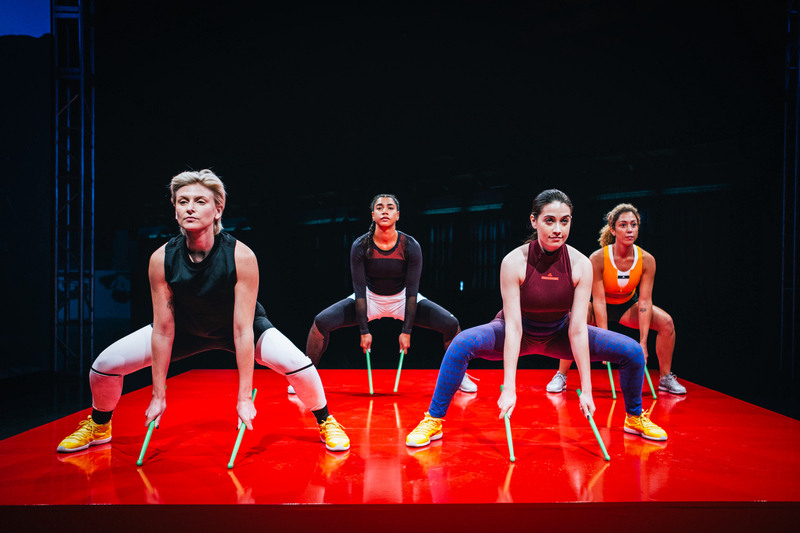 Another astonishing absence was ‘activewear’; but in that year, for the first time a high fashion designer, Stella McCartney, announced her pioneering partnership with adidas. 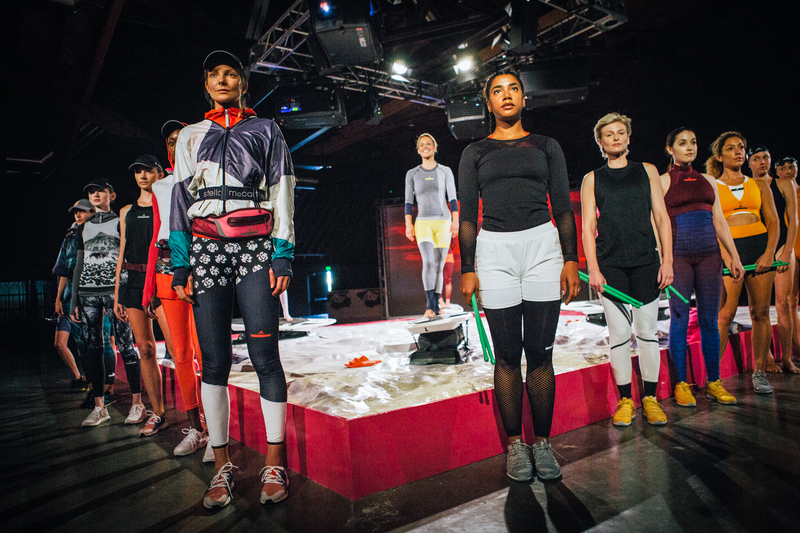 The belief was that ‘fitness’ and ‘fashion’ were more closely related than the world realised, and the combination would uniquely incorporate adidas’ technological, functional know-how with Stella’s beautiful and feminine silhouettes. 12 years on, we take for granted that women want stylish and functional sportswear – a trend coloured heavily by these early innovators! Yet adidas by Stella McCartney has always maintained a unique edgy aesthetic, whilst being high quality, and wonderfully distinctive. To me, it’s the perfect of example of a genuine partnership creating something that’s way more than just the sum of its parts. In LA this week, I was one of the lucky few who had the opportunity to interview the designer after her spectacular SS17 show which took place in West Hollywood. 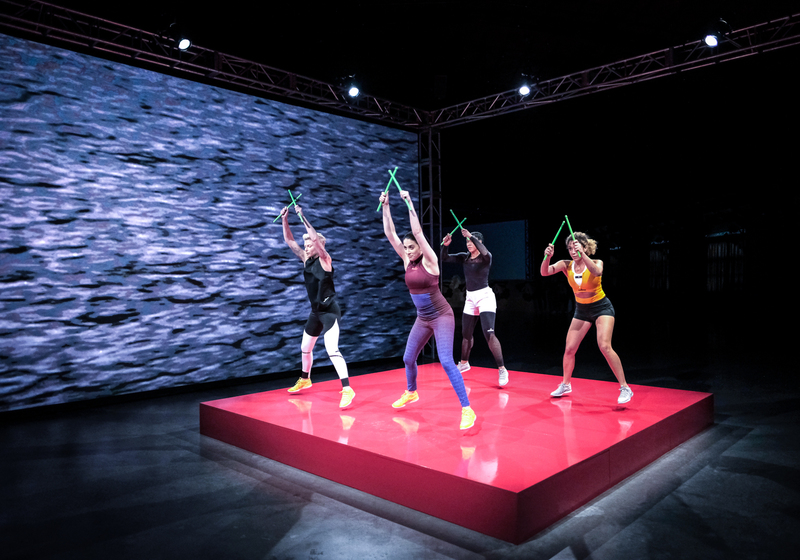 Click MORE to read about Stella’s view on ‘health’, ‘wellness’, the show, and how she goes about the design process! My impression of the collection is that it incorporates classic familiar devices, but with some fresh innovations; Stella who is known for her gorgeous prints and patterns has woven in her signature nudes but also combined them with fuschia, orange and black. These are bold statement colours, but not loud for the sake of loud. There are bomber-like jackets which I personally would love to wear at the gym or outside of the gym. Knitted jumpers which are still sweat-wicking provide a nice crossover option, and some pieces have bold leopard-inspired stripes running across the front, are oversized and playful – showing what I think is a more light-hearted side of the collection – not taking itself too seriously, which activewear often can! The live component was so fresh, with a ‘catwalk’ quite unlike any other I’ve seen. It was dramatic, energetic, sporty and massively inspiring. 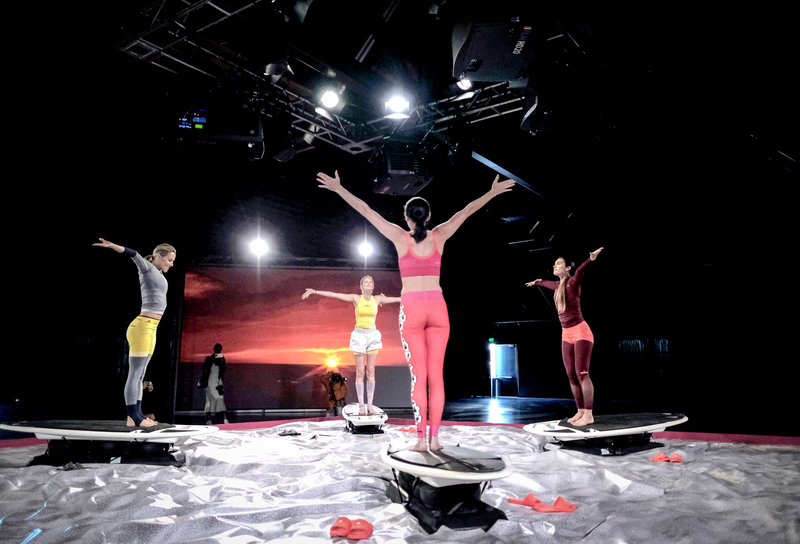 Upon arrival, guests were ushered into a vast, gritty industrial space where they could view four individual installations, each representing a different sport (dance, swim, cycle and yoga on surfboards). 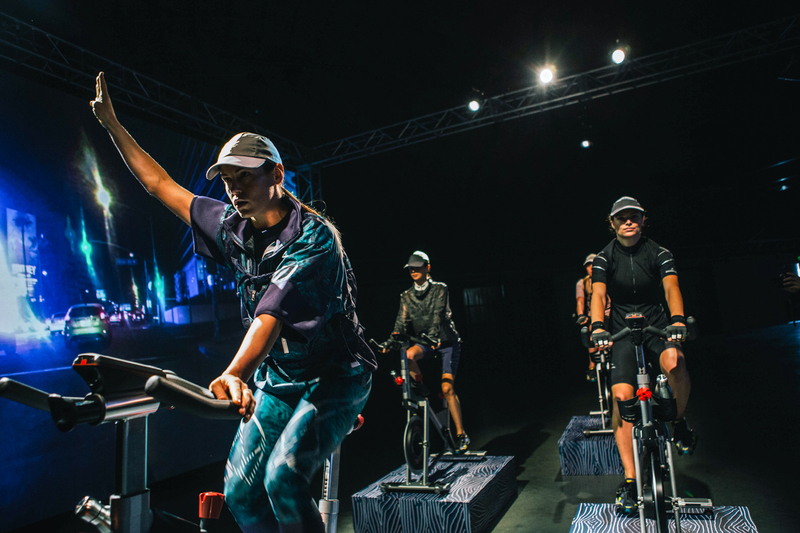 It also took you through the emotional states – mentally preparing, gearing oneself up for the session, the actual training (swim and cycle), followed by the final cool down (yoga). The music alongside complemented the tone. To start the girls at each installation were standing statuesque and fierce; then, with determination in their eyes, they started dancing in formation. It was an epic journey. F.O.T: What type of training do you do? Stella McCartney: It’s really dependent on how much time I have. Regularly! Ideally, I exercise six times a week, a lot. I would do it every day if I had enough time but it really depends on how much time I have. The type of training I do, I mix it up. Today was really a reflection for me of what I think is the reality of the life that we live. I find when I do the same workout over and over and over again number one I get bored and number two my body gets accustomed to it and I don’t see results. For me this is really how I like to work out, I’ll do 20 minutes of running quickly and then I’ll start doing a bit of yoga or I’ll do some muscular training, some cycling or I’ll ride my horse, go swimming. I’m a big believer of a ‘mix up’. 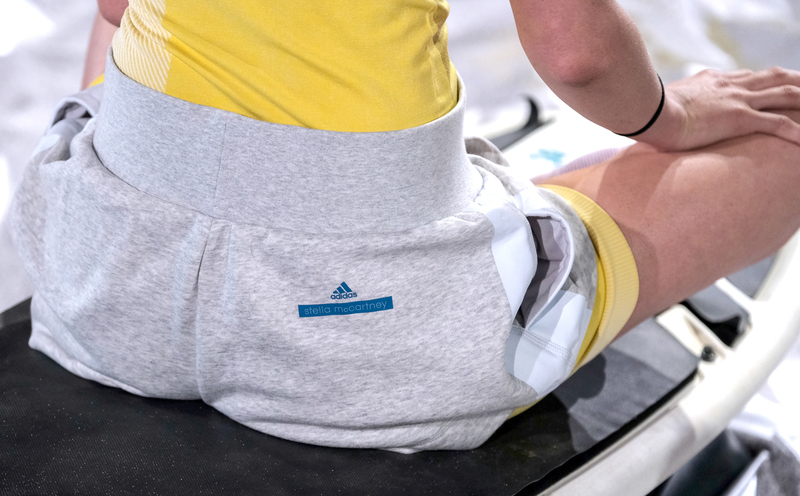 Your adidas line has always been the forefront of the athleisure movement; with so many other brands jumping on the bandwagon how do you see yourself staying ahead of the curve? Stella McCartney: You know what, today I was looking [at the collection] and thinking ‘wow, it still looks really great’. I think we’re still at the top of our competition in that we deliver great design and great technology and performance and that is what this collaboration is all about. I think we do have a lot more competition now and we’ve brought that upon ourselves if you like, but I think the reality is when we started no one else was doing it and no one knew where to sell it – it’s chic, fashionable and cool but it’s performance and sportswear and we didn’t want it in every sportswear store because we wanted to maintain a level of quality. Now, people understand it; for us to keep ahead of it is definitely through technology which is something adidas is at the forefront of. We have amazing things in this collection that we can bring to the customer and each season we’re just getting better and better at that. The true marriage between fashion and sportswear is what we do very well. Our quality is high and our price points are actually really competitive. I think people look at our stuff and think ‘oh I can’t afford that’, but it’s just because it looks so expensive and the quality looks so good but actually it’s completely in line with our competitors, If not under some of them. 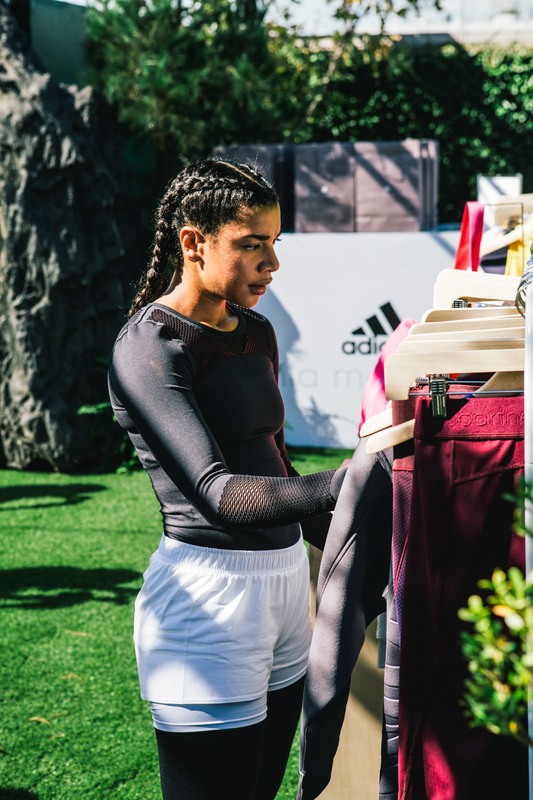 Also through adidas, I get to work with great athletes and there are very few collaborations for women, focusing and looking at female athletes and that’s something I take very seriously and luckily adidas do too. For us to really look at new areas and encourage new sports that are coming up, new workouts you can do; it’s a lifestyle thing for us too. Are there any specific pieces that you are excited to wear, and what’s your inspiration behind the beautiful and often vibrant use of colours that speak a lot to you as a designer? Stella McCartney: I’m a fan of colour and print. Bringing what I do in fashion to this collaboration, there’s never been a compromise to that. I’d never want anyone to sacrifice style for sport. I do know we all fall back on black, black, black – it hides our sweat and it hides a lot of stuff we don’t want to bring to the forefront in exercise – but for me, we all have that. So I really want to encourage new palettes and newness. For me, it’s a drawer that I turn to every day – I can go into my black section or I can actually go into my printed leggings and still wear something else and that’s something I really encourage; variety in sportswear. I really think ‘why not?’ You do it in your fashion so why wouldn’t you do that in your sportswear? We’re also trying to work with materials which are more sensitive to sweat and when I design I’m very aware of that so my prints and colours are very sympathetic to that. The catwalk was very entertaining, where do you find the inspiration to do something so different? 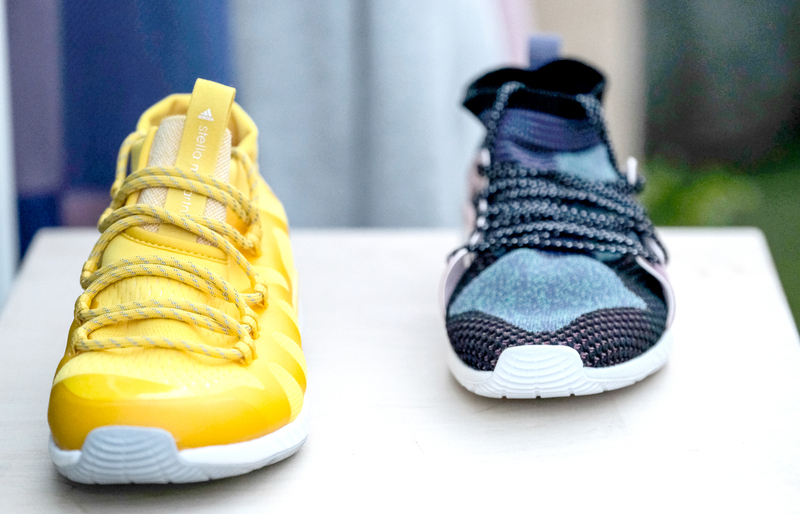 Stella McCartney: We’ve always done that with the presentations with Adidas. We like to have fun when we’re working. I can’t imagine the amount of things you go to and the variety of things you see because I actually don’t go to a lot of things in fashion. So for me I want people to come and to have an experience. It’s critical for ma that when I’m working with this collaboration that we’re watching women work out. It’s ridiculous to have them [models] static and acting ‘fashiony’. This isn’t a fashion show, this is about real life, real women, doing real performance sports and I wanted to show a variety of sports today. It was slightly inspired by triathlon. We introduced triathlon about 5-6 years ago to the range and this was really just trying to emulate life. This fact that we’re doing a variety of sports and trying to introduce new sports that are sort of up and coming here. Sports that I’m absolutely in awe of like the yoga on a paddle board. I look at the and I’m like OH MY GOD – it’s astonishing! For me, I want to people to have fun, to show the clothes working and I want to show what they do and to have real athletes – all those girls work out! Was there a particular reason why the show happened in LA? Stella McCartney: If we can’t show the range here, for this type of customer in LA, then I think we’re in real trouble. This is perfect for us because the approach we have to everything in my house is very much holistic and I think that mind connecting with body is a big part of working out. LA is one of the places in the world which has been afforded this weather, and that kind of way of approaching [fitness]. It’s a really active part of the world. 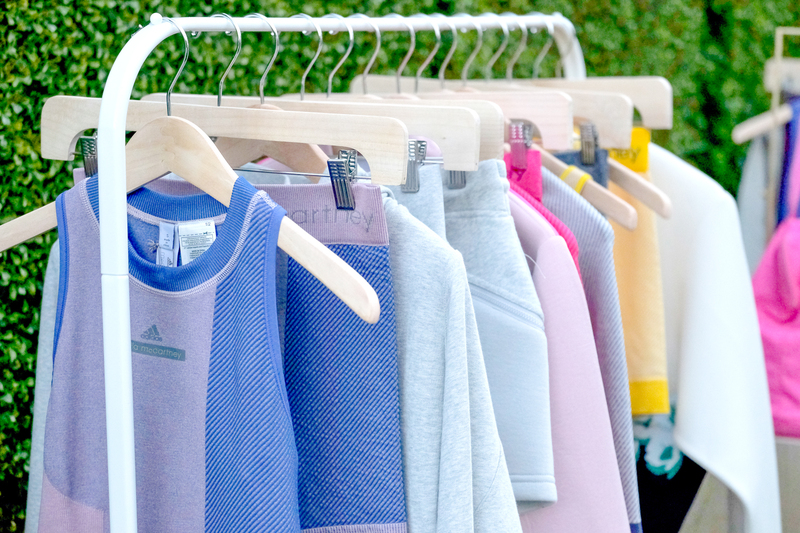 Can you express what you keep in mind when designing for adidas by Stella McCartney? Stella McCartney: Always I keep in mind women and how I want them to feel about themselves and try to encourage them to be their best. We’re also considering the environment. This is 38% sustainable this collection. We have tonnes of recycled polyester in the running, a lot of organic pieces, a lot of engineered pieces which have zero waste when we make them. Also, I’m always considering how I can help in a workout. I think it’s hard to motivate yourself to go out and workout. It’s so much easier not to go, right? I mean how much time do you allow yourself to work out in your day? We all say about an hour to get the shower done, to get out the door. It’s not a lot of time for us really. So when I start any collection it’s always with that emotion, that I’m trying to make this a bit easier and a bit more fun for women. I want them to feel good and look good. I don’t want them to think ‘urgh I’ve got to workout out and urgh I’ve got to wear that again’. I want them to have the technology, everything they need and I also want to educate them because I think that men are really treated with high regard when it comes to sports and I think women less so and I want to give women the same information and to know that we deserve the very best! In a world that’s becoming more and more health-conscious, what does the concept ‘healthy’ really mean to you? Stella McCartney: I think it starts with mind and then it connects with body. You got to be healthy in your mind to get through a day, that can mean so many things. That can mean meditation, that can mean rest, it can mean more sleep, you know – a million things! I do really believe that working out and connecting your mind with your workout is critical. I’ve spent so many years running on a treadmill for an hour and not burning any calories and hardly breaking a sweat, not really achieving anything but I’ve wasted that hour. I didn’t really want to push myself or I didn’t really know any better. I think that now I’m more informed. I know that if I workout more mindfully, I can workout shorter and get better results. If I’m thinking of I’m really going to work on that part of my gluteus, I’m connecting and I know that that part of my gluteus is going to get better results. I think it all connects! Do you have a mantra for this collection, because your last one was ‘Don’t Wish for it, Work For it’ ? 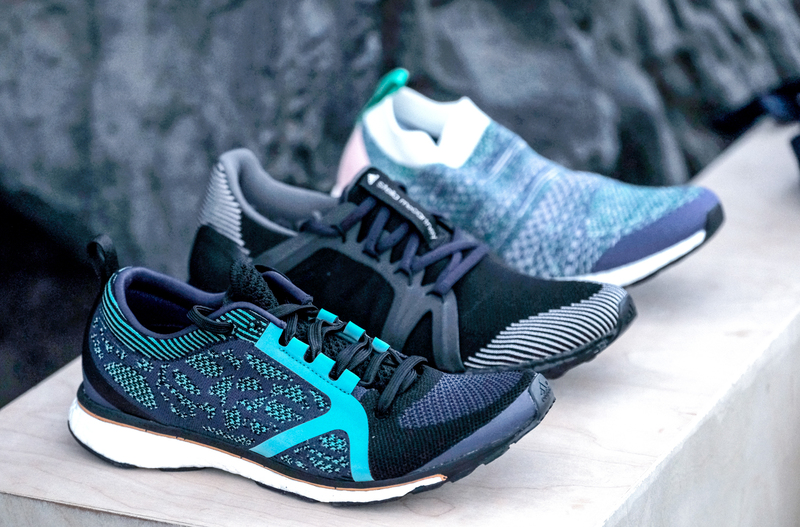 Stella McCartney: I’m not sure if I have a mantra, but you know I’m always a big advocate of getting outside when you workout, in summer especially, it’s really about celebrating yourself and celebrating summer and respecting yourself. Allowing yourself to look after yourself. What type of outfit makes you feel most confident or powerful? Stella McCartney: It depends on the day, let’s face it. 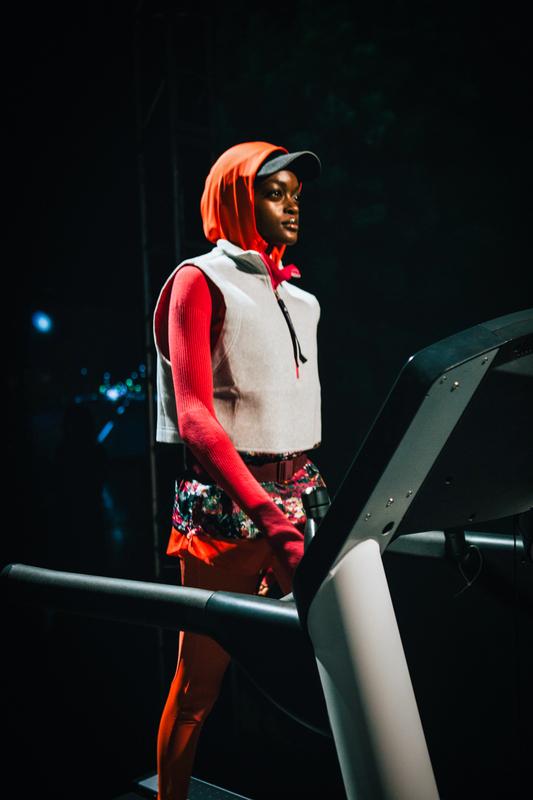 With sportswear, it really does depend on how you feel. You know, we’re changing all the time. When I was younger I thought ‘I’m going to look like this forever’, and you don’t, in a good way. You can improve with age and I think we’re living in an age which is very hard on how we look. For me the main thing is really just allowing yourself to do your best and when it comes to working out and wearing the right sportswear it’s important to kinda just be fearless. What’s your message to women who wear your collection? Stella McCartney: Thank you, number one, number two, I hope that you realise how much we put into it. There’s a lot of brands in life and there’s a lot of stuff out there and all I know is that the things that we do in this partnership is we consider everything – where’s that iPod going to go, where are the headphones going to go, how’s this length, how does that feel on her waist, do we want it here/there – there’s so many things that we consider; so I hope that you feel it and I hope that it works for you and helps you. Also, I think just be a conscious consumer, that’s important to us. This is more of an affordable price point than other things that we do so it’s important when you buy and invest in a piece you know that, hopefully, it’s going to be with you for life. The quality that we make is not throw away sportswear and there’s a lot of that out there now which become landfill. Our intention is that these pieces last not only in quality but also in design. I feel incredibly lucky and honoured to have met and interviewed such an inspirational and talented woman. A huge thank you to Stella McCartney and adidas for this wonderful opportunity. More to come! Faya this looks ana amazing experience! Lucky you! She seems to be very passionate! I love reading interviews with fashionistas, well done for getting a goodie. adidas always looks great whether it’s new lines or originals, I love it! Perfect collection. Just love it.